The best-selling self-help instructional book "How to Become a Successful Beauty Supply Store Owner". 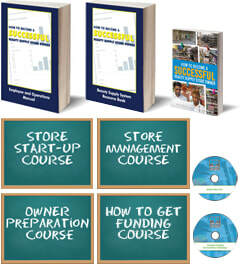 It provides step-by-step directions on how to successfully open a store and minimize mistakes. Due to retailing regulations, this system does not provide specific wholesale prices for products. These two books will specifically aid the transitioning entrepreneur in their journey into beauty supply ownership. The "Power M.O.V.E." book contains techniques to successfully grasp the concept of being an entrepreneur, employer and business owner. You will need to understand all 3 ideals and know how to conquer the challenges that arise amidst the journey. 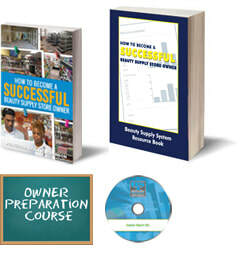 The "How to Become a Successful Beauty Supply Store Owner" book specifically lays out the steps to preparing, developing, opening, and running a successful beauty supply store. Both books were written by our company founder, Professor Devin Robinson, who has mastered the strategies he shares with you in these books. This is a great package deal for the early stage entrepreneur. 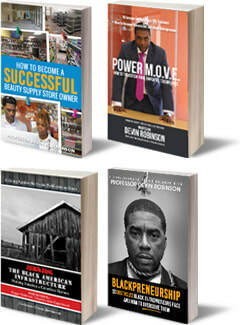 These 3 books will propel your life and work for generations. For someone interested in leaving a legacy, this is the package for you. You will follow directly in Professor Devin’s mental footsteps on exactly what he did to begin leaving his legacy. 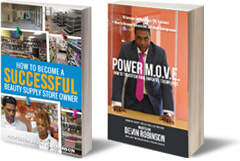 His book “Power M.O.V.E.” will teach you how to successful transition into entrepreneurship, while his book, “How to Become a Successful Beauty Supply Store Owner”, will teach you how to become successful specifically in beauty store ownership. His 3rd book of this set, “Rebuilding the Black Infrastructure”, explains his philosophy and approach on how the entire community can be taken back. This set is for the movement-minded revolutionary who would like to use entrepreneurship as a means to cure our community’s ills. These 4 books are what you need for a strong launch into business ownership. Professor Devin eloquently outlines exactly what he did to begin leaving his legacy by explaining how to open and run a beauty supply store, how to think like an entrepreneur, leave a job safely, overcome obstacles being black in business and how to act responsibly in the community as a business leader. “Power M.O.V.E. : How to Transition from Employee to Employer”, “How to Become a Successful Beauty Supply Store Owner,” “Rebuilding the Black Infrastructure: Making America a Colorless Nation" and "50 Obstacles Black Entrepreneurs Face and How to Overcome Them " are going to set you on the right path to abundance in business. A general guideline overview 8x10 format for the Retail Owner. 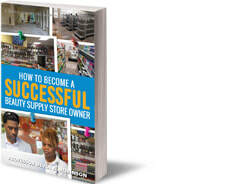 This book is a guideline for the Retail owner on how to setup their operations. It is an employee handbook that outlines areas that each employee must abide by. Areas such as, Operations Procedures, Vacation, and Opening and Closing Procedures are enclosed. It is not specific to each store. If you would like a customized version for your store, see below for details. Make our manual your own!! We will transform the manual to include your company name and logo information into a 6x9 binded, ready made manual for employee use. Ensure each new hire has their own book and eliminate excuses on policy violations! Hands down this well crafted book has it all! Chapter by Chapter you will learn what it takes to open your own store without all the fluff information. Figure out how much it will cost to open a store with our “Proven” formula. Due to retailing regulations, this book does not provide specific wholesale prices for products. Refund Policy: The are no refunds on products that have been delivered and accepted by the customer. Don't see what you're looking for? Beauty Supply Institute will customize a plan to fit your needs. Call our office Today for assistance! ​No exchanges or refunds for services rendered and products received.